Could former Defense Secretary Robert McNamara have changed the course of the Vietnam War? McNamara, who died at his Washington, D.C. home Monday morning at the age of 93, was a principal architect of America&apos;s Vietnam policy. Jeremi Suri , E. Gordon Fox Professor of History at UW Madison, says we now know that McNamara had deep misgivings about the conflict. "I would say historians have very mixed view of Robert McNamara. They see him as someone who saw the problems of the Vietnam War, but also lacked the courage and lacked the willingness to shift gears in policy," says Suri. McNamara never went public with his objections until twenty years after the end of the war which claimed the lives of more than 58,000 Americans. "I think the debate on Robert McNamara&apos;s life centered on that," says Suri. "Could he have done more, should he have done more, and should we feel sorry for him or should we be angry that now all these years later he&apos;s telling us we were wrong, and he knew we were wrong at the time." Suri says it&apos;s realistic to expect officials of McNamara&apos;s stature to speak out publicly when they disagree with policy: "they don&apos;t only have an obligation to the president, they have an obligation to Congress and they have an obligation to the American people." 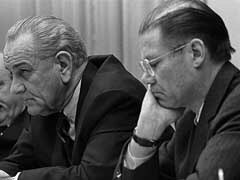 McNamara differed with President Lyndon Johnson on the course the war should take and resigned as Defense Secretary in 1967, but he did not speak out on what he regarded as the failures of U.S. policy until publishing his memoirs in 1995.